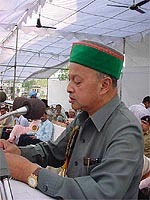 The Himachal Chief Minister, Mr Virbhadra Singh, today expressed concern over poor performance by government school students. As a result the number of students in the such schools was declining every year. The Himachal Chief Minister, Mr Virbhadra Singh, has ordered high-level probe into the prescription of spurious and sub-standard medicines by doctors posted at the local civil hospital and other dispensaries. It may be recalled that this action has been initiated following a news item published in The Tribune last month. Following administration of tetracycline, an old-fashioned broad-spectrum antibiotic, as advocated by a local private medical specialist, Dr M.P. Singhal, all 16 patients suffering from the mysterious fever were reporting substantial relief at the Zonal Hospital here. Mr B.B. Butail, Revenue Minister, has lambasted the BJP for “misleading” the people regarding the proposed ordinance to amend the Himachal Pradesh University Act and said the government could not allow top functionaries to indulge in corrupt practices under the cover of autonomy. An 11-year-boy, Ravi, of Namleri High School in Jogindernagar subdivision, who was mercilessly beaten by the PT inspector of the school, has been admitted to hospital. Hari Singh, father of the child, has lodged an FIR with the police and a case has been registered. Ravi was studying in Class VI. Concerned at the nomination of expelled and defaulting candidates to various boards in the state ignoring genuine party workers, the pradesh Congress committee chief and Power Minister, Ms Vidya Stokes said today that she had taken up the matter with the Chief Minister following a number of complaints. The district administration has suggested acquisition of 1,400-1,500 bighas of land by the Housing Board for the construction of an ambitious satellite township at Kairibungalow. Its earlier objection to acquisition of 2081 bighas in the area had run into rough weather with the land falling in the common pool. Three jawans of the Central Industrial Security Force posted at the Bhuntar airport were suspended for allegedly thrashing their colleague in August. Two persons died and one sustained serious injuries when an apple-laden truck rolled down a deep gorge at Galog village near Barog on the Kalka-Shimla highway this morning. The Samajwadi Party has announced it would contest all four Lok Sabha seats in Himachal Pradesh and launch an agitation against the performance of both BJP and Congress governments in the state. Addressing a function organised by the HP School Lecturers Sangh to honour him here Mr Virbhadra Singh said demand and duties were co-related and teachers should devote their time and work to provide better educational facilities to the students. He said the state government was abreast of their problems and would try to solve these. He announced the grant of practical allowance of Rs 175 to school lecturers and Rs 150 to the trained graduate teachers. Regarding rest of the demands of the teachers, he said these would be considered and met with sympathetically. He said: As a Chief Minister I’m very liberal. But as the Finance Minister of the state I am a tough master because it is not possible to run the state with meagre resources. Asha Kumar, HP Education Minister, Sudripto Roy, Secretary, Education and HP Director of Education, O.P. Sharma also addressed the audience on this occasion. Mr J.S. Rao, president, HP School Lecturers association welcomed the Chief Minister and others and submitted a charter of demands to them. The Chief Minister launched the e-governance scheme here amidst slogans shouting by members of the Hamirpur District Bar Association. The Chief Minister was greeted by slogan-shouting lawyers who were protesting against the converting of their litigants shed into the e-governance room. The Chief Minister, while talking to reporters announced that a new litigant shed would be constructed in the mini secretariat. He also laid the foundation stone of a diagnostic centre at the Zonal Hospital complex. A sum of Rs 3 crore would be spent on this project. He said that the next expansion of the state Cabinet would be done in the near future. He said Hamirpur district would get representation in next expansion. The state government has appointed Mr Tilak Raj Sharma, (Deputy Secretary, Health) as inquiry officer. Mr Sharma visited Palampur today and met a cross-section of society and gathered detailed information regarding the role of doctors in the sale and prescription of spurious and sub-standard medicines, in which they had been receiving commission in lakhs from drug manufacturers. Mr Sharma also called on the office bearers of “Save Palampur” and “Palampur Welfare and Environment Protection Forum” , voluntary social organisations who were the complainants in this case. Both organisations extended full cooperation to the inquiry officer. Later Mr Sharma also visited the Civil Hospital as an ordinary patient. Interestingly a doctor on duty also prescribed him sub-standard medicines and directed him to purchase the medicines from a particular shop. Earlier on Wednesday when Mr Sharma reached the hospital at about 9 am, there was no one on duty. At about 10 am a woman employee reached the hospital. Mr Sharma wanted to know the name of the doctor on emergency duty from her. Instead of cooperating with him she behaved rudely. Mr Sharma assured appropriate action against the guilty doctors. The hospital medical specialists, who were initially baffled and had described the disease as Pyrexia — a technical label for all high-grade fevers defying diagnosis — in their prescription slips and other official records, put all patients on tetracycline from Tuesday onwards. Even as the patients started showing a marked improvement with their body temperatures falling from as high as 105 degrees in some cases to almost normal within 24 hours, doctors collected the blood samples of eight patients and sent these for microbiological tests to the Central Research Institute, Kasauli, on Tuesday. Hem Chand, 40, of Chandi in this district told this correspondent that he had contracted the fever, which had shot his body temperature to 105 degrees, some 12 days ago. After initial treatment at the PHC, Chandi, he was referred to the Zonal Hospital here on September 12. However, his fever subsided only on September 17 after doctors had changed the medicine. But for a loss of appetite and frequent desire to vomit, he was feeling comfortable. All the other 15 patients, most of whom belonged to the neighbouring Rajgarh subdivision of Sirmour district, had an identical story to tell. The Chief Medical Officer, Dr Gulshan Narang, told this correspondent this evening that as per the report faxed by the Kasauli Institute, all eight samples had tested positive for typhus caused by the rickettsial cocobacilli, R. Tsutsugamushi. Similarly, ten out of the 12 blood samples sent last Monday by the IGMC, Shimla, to the CRI, Kasauli, had tested positive for typhus, confirming the diagnosis of Dr M.P. Singhal, as first reported by The Tribune on September 14. A medical officer of the Zonal Hospital, requesting anonymity, expressed surprise at the IGMC authorities’ persistence in seeking help from the National Institute of Communicable Diseases (NICD), New Delhi, and the National Institute of Virology (NIV), Pune. Typhus is neither a viral nor a communicable disease, he said. Meanwhile, a high-level team comprising Dr M.L. Chugh, Head, Department of Internal Medicine, Dr Ram Manohar Lohia Hospital, New Delhi; Dr Avdesh Kumar, Joint Director, NICD; and Dr Mahadev of the NIV and an epidemiologist visited the Civil Hospital at Arki and the Zonal Hospital here today. The team examined the case histories of each patient and also physically examined them. The patients told them that all of them were feeling better after the administration of red capsules (tetracycline). The NICD team that visited the hospital at 5.30 pm was busy holding discussions with the local doctors till the filing of this report. It, however, declined to make any comment till it had analysed the data and tested the blood samples. The high court has directed state government to formulate a policy for the collection, transportation and carriage to conversion plant of garbage from door to door here so that the unhygienic system of collecting garbage in dumpers may be done away with. The court directed the municipal corporation to levy fee for such collection to meet the expenses. A Division Bench comprising Chief Justice Vinod Kumar Gupta and Mr Justice R.L. Khurana directed the government to make available the site to the municipal corporation for relocating the conversion plant. The government was directed to start the plant within four months. Reacting sharply to the statement by Mr Ganesh, Dut, BJP spokesperson, accusing Mr Virbhadra Singh, Chief Minister, of adopting a dictatorial attitude, he said such charges were being levelled to thwart the crusade against corruption. He said the previous government had patronised corruption and emptied the coffers of the state by putting a financial burden of over Rs 15,000 crore on the exchequer. He said many institutions had become dens of corruption and now when the government was holding probes, BJP leaders were opposing and obstructing such efforts to save their own skin. Mr Butail said the Chief Minister’s zero tolerance to corruption had created panic among the corrupt and they were reacting against him for fear of being booked. He said by demanding the resignation of the Chief Minister, Mr Dut was trying to question the mandate of the people. He said that it was an insult to the will of the people who had voted for the Congress. The Revenue Minister said the government had no intentions of interfering in the affairs of the university, however the pretext of autonomy would not be accepted for sheltering the corrupt. An 11-year-boy, Ravi, of Namleri High School in Jogindernagar subdivision, who was mercilessly beaten by the PT inspector of the school, has been admitted to hospital. Hari Singh, father of the child, has lodged an FIR with the police and a case has been registered. Ravi was studying in Class VI. According to Dr Chander Mohan Bisht of the Civil Hospital, Jogindernagar, the body of the student carried impressions of the rod. The child had injuries on the head and the legs. When his rod broke, the teacher reportedly kicked the child and rained blows on him. “Ram Singh would have killed my child had the two teachers, Raj Kumar and Shesh Ram, not intervened and forcibly taken him out of the classroom”, said the father, his voice choked. Hari Singh said the teacher reportedly got angry when the boy failed to convey his message to a woman in the village. Mr R.K. Sharma, Deputy Director, Education, is conducting an inquiry into the case. She said several complaints had been received from Solan, Shimla, Bilaspur and Hamirpur where even those owing allegiance to the BJP had managed to get a berth in various boards. Talking to mediapersons today, she said those abstaining themselves from party functions regularly would be issued notices and actions would be initiated against them. Expressing satisfaction over the working of the government, she said slackness would be checked and instructions had been issued to the DCCs and BCCs in this regard. Later addressing students at the closing of the senior secondary summer season schools tournament, she said physical fitness and special listed training were the key to excel in sports. She distributed prizes to the winners. The district administration has suggested acquisition of 1,400-1,500 bighas of land by the Housing Board for the construction of an ambitious satellite township at Kairibungalow. Its earlier objection to acquisition of 2081 bighas in the area had run into rough weather with the land falling in the common pool. Hence, the revenue authorities along with officials of the Housing Board had to conduct a fresh survey to explore the possibility of acquiring land there. At a meeting yesterday with the Chief Parliamentary Secretary, also Chairman of the Housing Board, Mr Mukesh Agnihotri, the Deputy Commissioner, Mr Rajesh Kumar apprised him about the land availability in the area. It is learnt that 323 bighas belonging to the Industries Department is likely to be surrendered to the government. The Deputy Commissi-oner said the procedure for demarcation would soon begin. The possibility of land acquisition, as per this new survey, had been conveyed to the Chairman of the Housing Board. The five villages where acquisition of land had been suggested are Sudhag, Malga, Baroughd, Anji and Manjhol. Following this, the procedure for the transfer of 323 bighas of IT land to the Revenue Department would also begin soon. Talks are already under way with the Industries Department in this regard. This land was earmarked for the development of IT-related industry owing to its proximity with the IT university. Three jawans of the Central Industrial Security Force (CISF) posted at the Bhuntar airport were suspended for allegedly thrashing their colleague in August. Even the police and the Airport Authority of India had not been told about the assault. The security chief at the airport, Assistant, Commandant S.K. Sharma when contacted, denied commenting on the matter saying that it was an internal matter of the CISF which had already been settled. The Senior Aerodrome Officer, however, said that matter was of grave concern as the three persons had been withdrawn from the airport security and the Airport Authority of India had not been told. On August 4, three CISF jawans — Rattan Singh, Om Prakash and Prem Singh — had allegedly attacked one of their colleagues, R.B. Singh, while he was asleep. This is not the first incident where jawans of the CISF have attack their colleagues at the airports. The Namdeo incident at Mumbai airport the firing incident at Delhi airport and the killing of a senior officer by a CISF personnel in Delhi this point to the seriousness of the situation. The Airport Authority of India Employees Union (AAIEU) had objected to the installation of the CISF at the airports. The airlines staff at the Bhuntar airport have also been complaining of their harsh behaviour with the passengers, staff and the crew. According to information, Ranjit Singh, the driver, lost control of the truck. Chander Bahadur, a migrant labour residing at Galog, informed the police about the incident. Babloo, truck cleaner from Santokhgarh in Una district, died on the spot while Ravinder Kumar, a trader from Aani in Kulu district, died on the way to hospital. Mr Ram Asray Sharma, in charge for the party in the state, said at a press conference here yesterday that the BJP and the Congress were levelling charges of corruption against each other, but both had done little for the development of the state.